Roldano Lupi (1909-1989) was an acclaimed Italian actor of cinema, television and theatre. Despite being the leading man of many successful films of the 1930s and 1940s, he was never considered a true star by the public. Italian postcard. Ed. Ballerini & Fratini, Firenze (B.F.F. Edit. ), no. 1427. Photo: Vaselli / E.N.I.C. Roldano Lupi was born in Milan in 1909, as son of Domenico and Maria Tardiani. He earned a degree as accountant in Milan, and later dedicated himself to acting for sheer delight, becoming part of the cast of some local amateur stage companies. His transition to professional acting took place relatively late in 1938, when he had the opportunity to enter the celebrated Kiki Palmer company. After this, his career underwent a strong acceleration. He first moved to the company of Guglielmo Giannini, and in 1942 to that of Ruggero Ruggeri and Dina Galli. In the meantime, Lupi started his career in the cinema. In 1941 he made his film debut in the romance Sissignora/Yes, Madam, directed by Ferdinando Maria Poggioli – whose favourite actor he became. Here he played the role that made him famous, that of the selfish and cynical lover, of Evi Maltagliati in this case, who plays the employer of the protagonist Cristina (Maria Denis). More success came to Lupi the following year, as the protagonist of the drama Gelosia/Jealousy (Ferdinando Maria Poggioli, 1942). Here he is a marquis who weds his love interest, a farmer girl (Luisa Ferida), to one of his tenants, with the promise the marriage may not be consumed. He shoots the tenant out of jealousy. He confesses his crime to a priest but refuses to denounce himself, hiding in a wedding with a noble lady. Too late, he repents his mistakes. In 1943-1944, he worked on the film Circo equestre Za-bum/The Za-Bum Circus (Mario Mattoli, 1944). The film was shot clandestinely in Rome during the Italian Social Republic also known as the Republic of Salò (1943-1945), when the country was occupied by the Germans and all cinematic activity was transferred to Venice. Many actors and technicians decided to stay in Rome, some with work permits delivered by the Vatican State, and the not so lucky - like those involved in this film - working clandestinely. Italian postcard by ASER (A. Scaramaglia Edizioni Roma), no. 353. 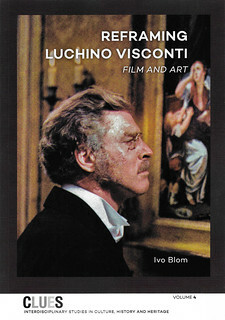 Photo: Civirani / Lux Film. 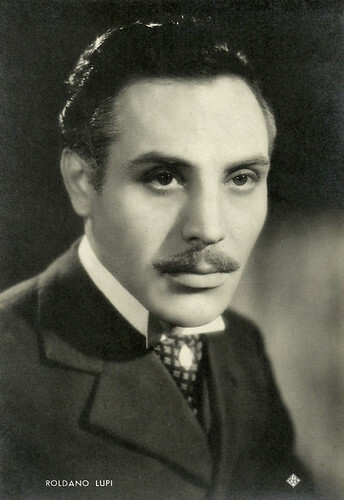 From that time until the immediate post-war period, Roldano Lupi became one of the leading men of the Italian cinema. He characterised his interpretations with seriousness and professionalism. This earned him strong acclaim by the critics, who, however, sometimes criticised him for sometimes too fixed kinds of expressions. During the war, Lupi acted in Nessuno orna indietro/Responsibility Comes Back (Alessandro Blasetti, 1943), Il cappello da prete/The priest's hat (Ferdinando Maria Poggioli, 1944) and La porta del cielo/The Gates of Heaven (Vittorio De Sica, 1944). The latter film is the story of a train full of sick and deformed pilgrims on their way to seek miracles at the shrine of Our Lady of Loreto, near the city of Ancona in eastern Italy. La porta del cielo was made during the German occupation of Rome, with support from the Vatican. This allowed Lupi and other actors, under pressure to go north and work in Venice for the film industry of Mussolini's Italian Social Republic, to remain in Rome. Lupi was equipped with a face with a thick and frowning expression. 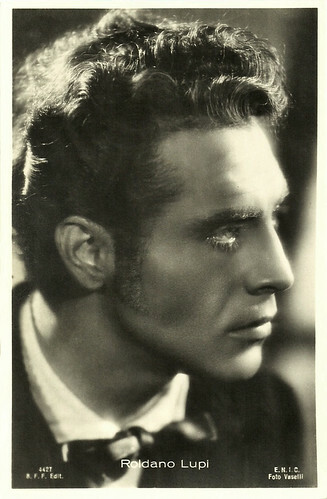 So, despite being the leading man of many successful films, he was never considered a true star by the public who rather favoured actors like Massimo Girotti, Amedeo Nazzari, Fosco Giachetti, and Andrea Checchi, even if at times they played parts similar to his own. Precisely the roles he was constrained to - the jealous and crazy lover, the perverted and unwilling nobleman ready for money, the disturbed assassin - became in some respects Lupi’s professional strength. The expression to the limits of the madness that he was able to infuse his characters, and the cloudy air around him signed him deeply, but in other respects these features also limited his career and popularity. In the postwar period, he was remarkable in the crime film Il testimone/The Testimony (Pietro Germi, 1945) with Marina Berti, L'adultera/The Adulteress (Duilio Coletti, 1946) with Clara Calamai, Il delitto di Giovanni Episcopo/Flesh Will Surrender (Alberto Lattuada 1947), and Altura/Height (Mario Sequi 1949), alongside Mario Girotti and Eleonora Rossi Drago. 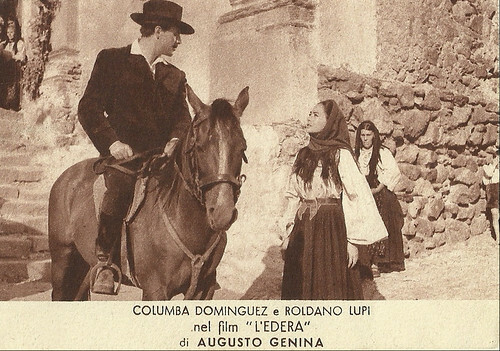 In 1950, he appeared in L'edera/Devotion (Augusto Genina 1950) opposite Columba Dominguez, who plays a girl, adopted by a declining aristocratic family. This Italian rural drama was shot in Barbagia, Sardinia. Vitaliano Brancati contributed to the script, based on a novel by Grazia Deledda. The film quite closely follows the novel, which takes place on the province of Nuoro, but offers a less drastic finale. 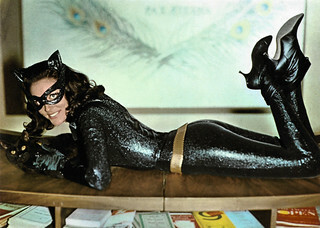 Progressively, in the second half of the 1950s, Lupi was increasingly employed in character roles. In 1944, he had returned to the theatre. First he worked with the Magnani Ninchi company, then in 1947, with only Carlo Ninchi. 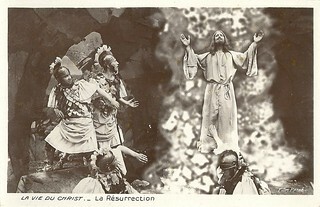 He later became the protagonist of the great Medea summer show in 1949. In 1951, with the company of Guido Salvini, he continued his activity on the stage, starting also as radio and voice actor. He dubbed Walter Pidgeon in the cult film Forbidden Planet (Fred Wilcox, 1956), but also Leo Genn, George Montgomery and the famous western film actor Roy Rogers. Italian postcard by Ed. Mondadori. Photo: Cines / E.N.I.C. / AGAR. 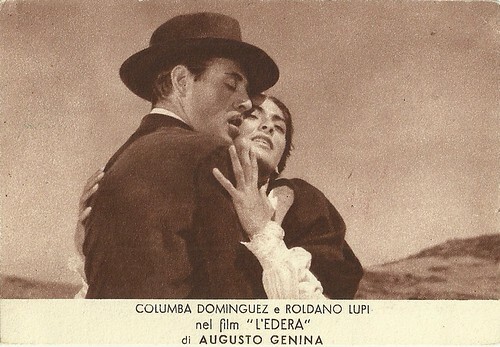 Columba Dominguez and Roldano Lupi in L'edera/Devotion (Augusto Genina, 1950). Even in the 1960s, Roldano Lupi continued to work in the cinema in many genres, even as a leading man in a Peplum. He worked with such directors as Riccardo Freda, Domenico Paolella, Primo Zeglio, Umberto Scarpelli and other specialists. Yet, he also took the pleasure of shooting films with French filmmakers like Claude Autant-Lara, Christian-Jaque, Bernard Borderie and Henri Decoin. He was Captain De Treville in I cavalieri della regina (1954), co-directed by Mauro Bolognini and Joseph Lerner and based on Alexandre Dumas' The Three Musketeers. With the emergence of television, Lupi's commitments gradually shifted from the big to the small screen, such as in Mont Oriol (Claudio Fino, 1958), L'isola del tesoro/Treasure Island (Anton Giulio Majano, 1959), Tom Jones (Eros Macchi, 1960), Una tragedia americana/An American Tragedy (Anton Giulio Majano, 1962), La sciarpa/The Scarf (Guglielmo Morandi, 1963), I miserabili/Les Miserables (Sandro Bolchi, 1964), and David Copperfield (Anton Giulio Majano, 1965). In the same year he took part in Questa sera parla Mark Twain/This evening speaks Mark Twain (Daniele D'Anza, 1965), starring Paolo Stoppa. He was also in other TV dramas including Le mie prigioni/My prisons (Sandro Bolchi, 1968) and Eleonora (Silverio Blasi, 1973). His intense stage and TV career lasted until 1979 when he appeared for the last time in an episode of the TV series Racconti di fantascienza/Science fiction stories by Alessandro Blasetti. Roldano Lupi was married to the Venetian stage actress Pina Bertoncello. He died in Rome in 1989, and lies buried in the Cimitero Flaminio in Rome. Italian postcard by Ed. Mondadori. Photo: Cines / E.N.I.C. / AGAR. 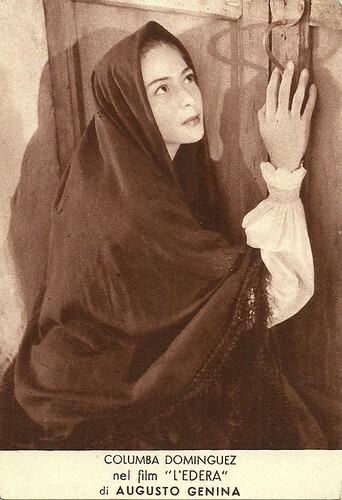 Columba Dominguez in L'edera/Devotion (Augusto Genina, 1950).